For a while we've been hearing grumblings about the next installment of Flying Fish's excellent Exit Series—something about local Jersey rye here, Belgian whispers there—and now the announcement has finally come. During Beer Week, Flying Fish will debut Exit 6 Wallonian Rye Belgian-Style Ale, a collaboration between Head Brewer Casey Hughes, Ric Hoffman of Stewart’s Brewing Company in Bear, DE, and Gordon Grubb of Nodding Head Brewery. “Exit 6 is named in honor of the area’s first settlers, Dutch Walloons (now Belgians), who landed, built a fort – and then promptly constructed a tavern. They were definitely our kind of people!” says owner and founder Gene Muller. 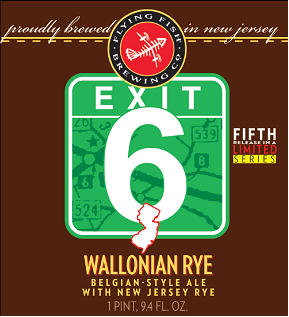 Exit 6 Wallonian Rye Belgian-Style Ale is named for the exit that “puts the green in Garden State,” a part of Burlington County that was settled in 1624. The surrounding farmland has long been an agricultural anchor, and the locally grown rye used in the beer comes directly from an area farm. The beer itself is a deceptively simple recipe: pale malt augmented by 20 percent rye, then fermented with Belgian yeast, giving it a bright saffron color and spicy character. The beer’s lemony citrus notes come from the addition of English East Kent Goldings, Slovenian Styrian Goldings and unusual Japanese Sorachi Ace hops. The beer will debut 3 p.m. Saturday, June 5 at Nodding Head (1516 Sansom Street). The event is free; beer is pay-as-you-go.